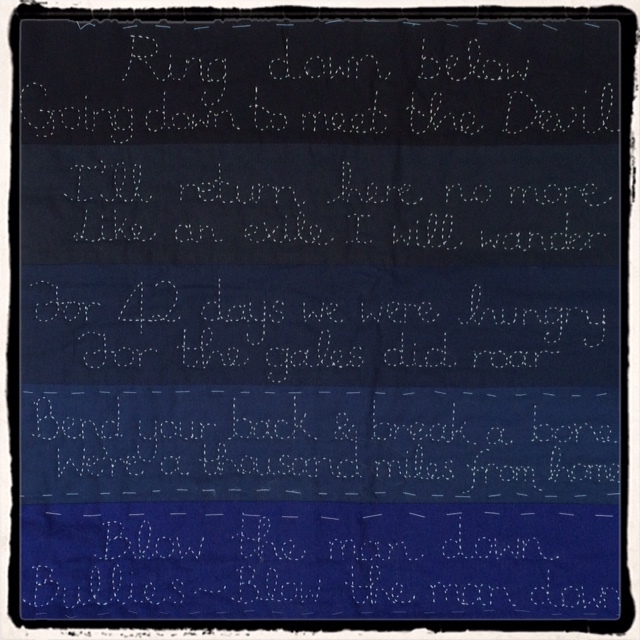 Stitched Sea Shanties – a work in progress – is there room for me to sew? I have spent most of my sewing time over the last five months working on the Nelson Quilt, but I have also found a little bit of time for other projects. 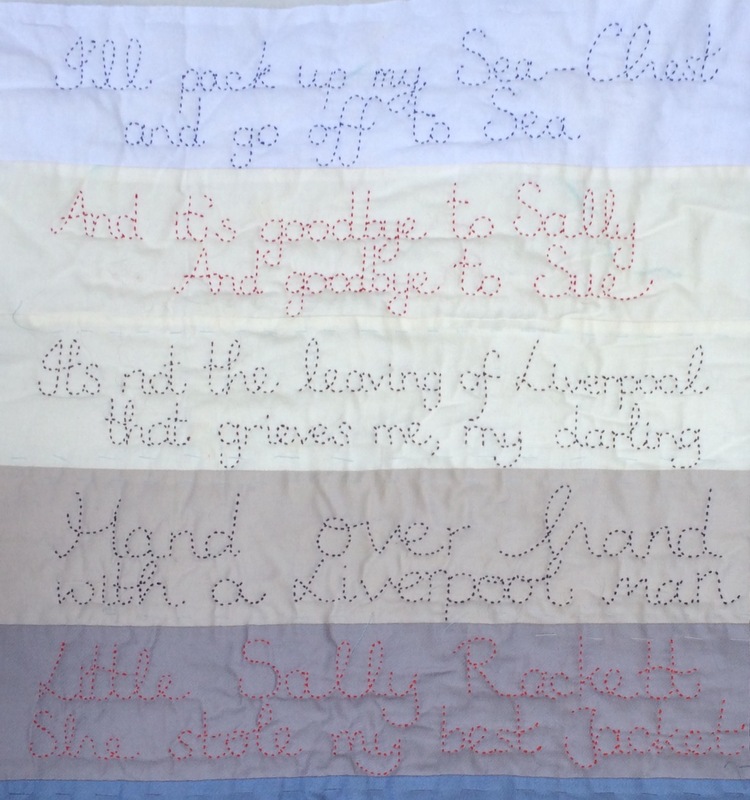 One of my works in progress is another quilt on a seafaring theme – a quilt made up of Shanties and Sea Songs. 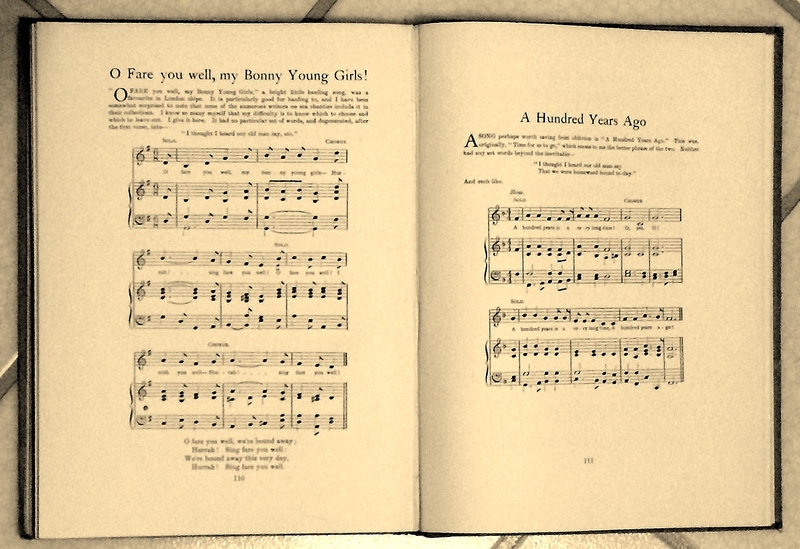 When I was very small, my Dad had a great recording of Sea Shanties that I loved. It included The Leaving of Liverpool, Little Sally Rackett and Admiral Benbow. I was terrified by Lowlands, a song full of haunting lament which I still find unsettling, and exhilarated by a rousing rendition of Round the Bay of Mexico. More recently, I spent about four years trying to track down this recording. I was hindered by the fact that I didn’t know the name of the band or the singers and so I searched out recordings of individual songs in the hope they would be the right ones. I ended up downloading lots of sea songs and shanties but none were what I remembered and most of them were far too tame for my taste. There were two notable exceptions: I came across the magnificent Storm Weather Shanty Choir from Norway and their stamping, raucous, joyful singing of Boney (“Boney was a warrior, a way, hey, YAR!”), Reuben Ranzo and South Australia, and the heartfelt melodies of The Maid of Coolmore and Swansea Town (“Fare thee well to thee sweet Nancy, a thousand times adieu. I’m bound to cross the ocean, girl, once more to part from you…”). I also relished recordings of Pump Shanty and Liverpool Judies by Straight Farrow and the Windjammers. Eventually, I established that the recording I was looking for was made by the Twelve Buccaneers in 1967 and, sadly, is no longer available unless you can hunt down an old vinyl LP. I managed to get my hands on a copy and found something on which to play it on. As soon as the mouth organ on Round the Bay of Mexico started up, I knew I finally had what I’d been looking for. All this searching for an old recording means that I’ve listened to lots of sea songs and shanties and, along the way, I became interested in their meaning. There are songs that are sung on the voyage out; songs for the times when well underway; and songs for the return home. There are also songs about sailors’ exploits ashore – mostly involving drinking and women and being duped by one as a result of the other. Many of the songs are cyclical – the singer tells of going to sea, his privations on voyage, the return home and determination to stay on land with his wages, and, after a night involving alcohol and women during which all his pay is spent or stolen, embarking (not always willingly) on another voyage. Other songs are laments at leaving a lover and yearning for reunion, and still others tell of the cruelty of a captain and hardship on board ship. And there is a difference in their status – shanties are work songs and traditionally only sung aboard ship, while sea songs are for relaxation and may be sung aboard or ashore. 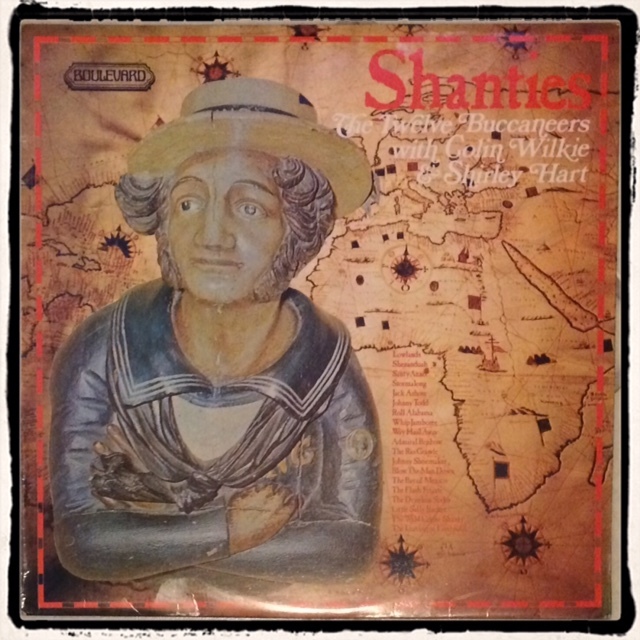 Sea songs and shanties often involve language and sentiments that are very much of their time, including some highly colourful slang and particularly gendered swearing. I’m no prude but I wasn’t sure about how I felt about quilting some of the words, particularly those relating to women. I took a quick poll via twitter and the consensus seemed to be that swearing on a quilt would be acceptable on a wall quilt but not on a bed quilt – a distinction I hadn’t considered, and a view not necessarily shared by other quilters. So I haven’t made a final decision about all the wording yet – I have an idea about which lyrics to use, but I’m still wrestling with the realities and meaning of songs that have passed down the generations since the 19th Century and how to represent them in 2015. Pingback: The Shanty Quilt: Part One – Leaving Home | is there room for me to sew?